I swear this series just keeps getting better and better. I've been saying this a lot, but this time I really can't believe that I waited months before getting around to this book. I'm pretty sure I bought this book on the day it was released or close to that and I just started it this month. Once I started reading I didn't want to stop, so when I realized that I was only a few pages from the end I put the book down for a little bit because I didn't want it to be over. It was just that good. 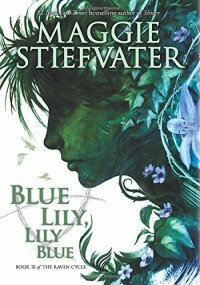 I'm pretty certain that I say this in all of my reviews of Maggie Stiefvater's books, but I need to say it again. Stiefvater has a gift with words. I always look forward to reading her latest books and I doubt I'll ever get tired of her writing style. It's so easy to picture all the scenes in the book and the descriptions don't slow the pace down, it only adds to the story. At some points I went from laughing to intense shipping to wanting to cry. I'm looking at you, Chapter 26. I love how flushed out all the characters are. The dynamic between Blue, Gansey, Adam, Ronan, and even Noah is just so real and I can't help but love all of them. I love the scenes with Blue and Gansey because they're so cute, but it's also really heartbreaking since he's supposed to die at some point, probably soon. I also really enjoy the scenes with Adam and Ronan. Ronan's wild and completely unpredictable and Adam is this honest, hardworking, reliable guy and I feel like the two characters compliment each other so well because neither of them will ever admit it, but they kind of need each other, especially Ronan. As expected, the romance has been pushed to the side for most of the book, but in the next book we'll probably get a lot more and I'm really hoping that something will happen between Adam and Ronan. I don't think I'm ready for something more to happen between Blue and Gansey, but at the same time I really want it to happen. I can't wait for the next one and my guess is that I'm going to need a lot of tissues when I read it.